Qatar Airways offers you a network of possibilities to explore the world. 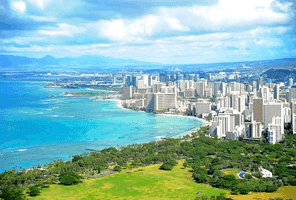 From relaxing in the Maldives or tasting world-class cuisine in Singapore to indulging in luxury designer shopping in Bangkok or perhaps even tackling incredible desert safaris in Dubai. Qatar Airways’ will offer a daily non-stop flight between Doha and Dublin, the capital of the Republic of Ireland, commencing 12 June 2017. Passengers flying from Dublin will be able to enjoy a quick & convenient transfer from Hamad International Airport as they travel onwards to any of the 150 destinations on Qatar Airways’ network. 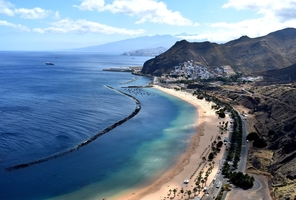 The route will be operated by a Boeing 787 aircraft featuring 254 custom-made seats across its Business & Economy Class cabins with specially designed interiors. Business Class is configured in a 1-2-1 layout of 22 seats, while Economy has 232 seats in a 3-3-3 layout. All seats feature individual television screens and on board WIFI, with Business Class seats reclining into a fully flat bed. New Airbus A350 service from London Heathrow! 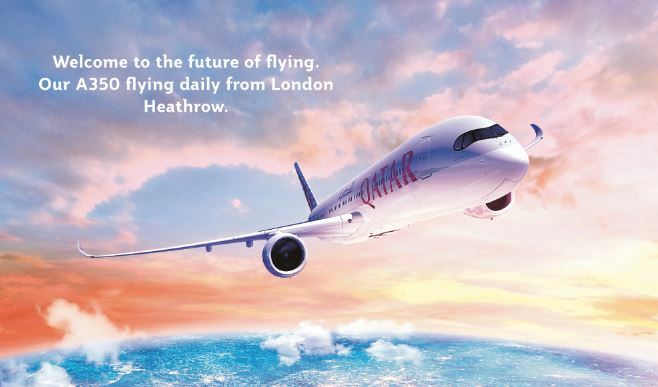 Qatar Airways is proud to announce the introduction of the world’s newest aircraft on our London Heathrow to Doha route. The A350 will operate the QR15 and QR16 night flights. 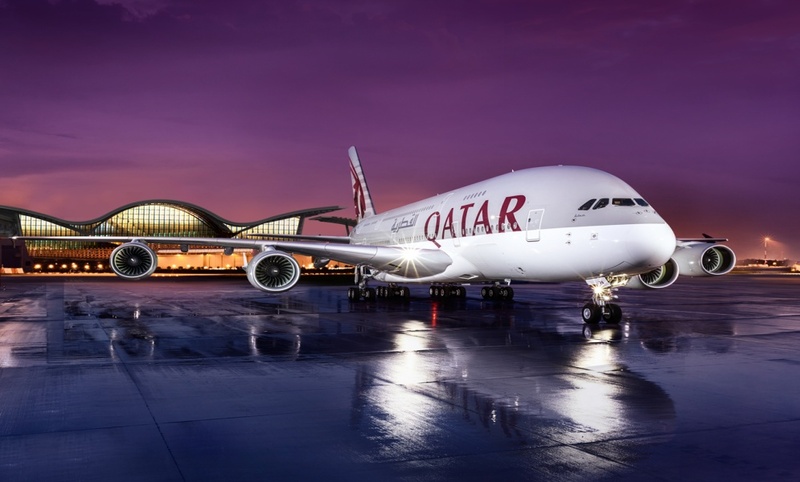 Airbus A350 XWB: Qatar Airways demands excellence for its passengers. This is why they chose to be the launch customer for the most modern widebody aircraft flying today – the Airbus A350 XWB. The Qatar Airways A350 XWB (Xtra Wide Body) provides outstanding levels of comfort and reliability using the latest state-of-the-art technology for a totally unique passenger experience. The A350 XWB is the latest member of the leading Airbus wide-body product line. The A350 XWB was built, above all, for passengers’ well-being. Wider seats in both Business and Economy classes, the lowest twin engine noise level of any aircraft, advanced air conditioning technology and full LED mood lighting, all work together to enhance the comfort of passengers, while reducing fatigue after a long flight. The A350 XWB’s innovative technology also improves performance in operation. Its revolutionary airframe and simplified systems have optimized fuel burn, maintenance costs and reliability, and its engines have the lowest CO2 emissions of any in the widebody category. With the unique combination of passenger comfort, technological innovation, lowest seat mile cost in its class and unprecedented revenue potential, the A350 XWB has the extras that make the difference. Passenger Experience Interior: The Qatar Airways A350 XWB is a perfect combination of innovative airline product design and intrinsic comfort of the cabin, which is the hallmark of this new aircraft. The seats and special amenities in each of the cabin classes are proprietary to Qatar Airways, and have been crafted in close collaboration with the respective manufacturers. Passengers will benefit from a new boarding experience upon arrival at the aircraft, achieved by a unique dome-ceiling entrance with welcome light distribution. Business Class: 36 seats in a 1-2-1 configuration. Featuring an 80” full flat bed, 17” HD in-flight entertainment screen. All seats have direct aisle access. Economy Class: 247 18-inch wide seats in a 3-3-3 configuration, with up to 32- inch pitch. A 10.6” in-flight entertainment screen, and more space at shoulder level for passengers in window seats, thanks to a vertical side wall panel design. Comfort and well-being: Uniquely comfortable configuration. The Qatar Airways A350 XWB features the state of the art Oryx entertainment system, with more than 1,000 entertainment options on individual screens in all classes. This entertainment system will be operated on the latest digital system from Thales called Avant and includes a digital handset, offering a ‘second screen’ experience. This will allow, for example, passengers to have the moving map displayed on the handset to follow a journey, while at the same time watching a movie on the main screen. A USB and Apple Iport socket is available in all classes to enjoy entertainment from a passenger’s own device and for re-charging the device. The A350 is a faster, more efficient aircraft as a result of its tapered wing, marking an evolution in aerodynamic design. With dynamic LED mood lighting and a high precision air management system that filters air every few minutes, you will breathe pure air throughout your journey and arrive refreshed. Welcome to a new world of space and comfort onboard our new A350 due to its extra-wide fuselage. Enjoy wider space in Business Class with stowage for two roller bags in the supersized overhead bins and up to 18” wide seats in Economy Class. You may also stretch your legs without encountering any obstacle as we are the first airline to integrate the in-flight entertainment system power box into the frame of the seat. The world’s newest aircraft takes entertainment to a new dimension with a fourth generation in-flight entertainment system. You can choose up to 3,000 entertainment options all brought to life in high definition on Thales Avant touch screens and enjoy 3D audio that gives the effect of high-fidelity surround sound, in Business Class. And because we know how important it is to stay connected, there is WiFi and GSM data services available onboard. LED mood lighting reduces the effect of jetlag and contributes to passenger comfort. GSM, GPRS and Wi-Fi is available in all classes for use on laptops, phones and tablets. The widest seats of any jetliner in its category, with generous room in all classes. Window seats are truly window seats, with wide panoramic windows that go from fully transparent to 100% light-blocking, offering Xtra flexibility and customised comfort. A flat floor smooth design offering Xtra legroom for all passengers. Optimal cabin air quality (air exchange every two to three minutes, advanced air conditioning technology and unique control of humidity level) providing passengers with an Xtra relaxing flight, for more comfort and less fatigue on arrival. A smooth flight is assured by virtue of the A350’s advanced flight control system, which constantly adapts to minimise gust induced wing loading. 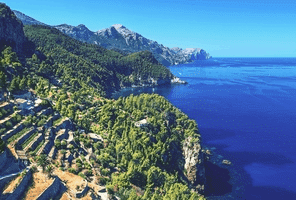 Choose from 8 flights a week to over 150 destinations! Passengers from Birmingham are now able to fly on one of the youngest fleets in the skies thanks to our Boeing 787 Dreamliner. With luxurious seats, world-renowned chef creations and unlimited entertainment options, you’ll discover a new level of luxury and hospitality. An amazing experience awaits you! Qatar Airways is the national carrier of the State of Qatar. Currently undergoing rapid expansion, Qatar Airways is one of the fastest growing airlines operating one of the youngest fleets in the world with a worldwide network of 146 destinations. Part of the Oneworld alliance, Qatar’s codeshare Partners include American Airlines, Azerbaijan Airlines, Bangkok Airways, British Airways, Japan Airlines, JetBlue, Asiana Airlines, Gol Linhas Aéreas Inteligentes, Malaysia Airlines, Middle East Airlines, US Airways, SNCF, Oman Air, Japan Airlines and Cathay Pacific. Current Fleet of aircraft include: 28 Boeing 777-300ERs, 9 Boeing 777-200LRs, 22 Boeing 787 Dreamliners, 8 Boeing 777F Cargo Freighters, 24 Airbus A340-600s, 35 Airbus A320s, 16 Airbus A330-200s, 13 Airbus A330-300s, 6 Airbus A330 Cargo Freighters, 2 Airbus Long Range A319LRs, 8 Airbus A321-200s, 4 Airbus A380 and 11 Airbus A350. 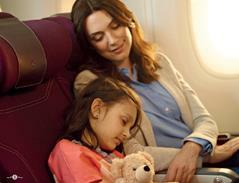 Special Features: 180-degree horizontal flat beds in First Class beds on both Airbus A330s and A340s. All classes in these aircraft type have personal video screens. A340s and A330-300s feature 15-inch seatback LCD TV screens in Business and First Class and the long-haul fleet has a unique Audio Video On Demand entertainment system. The Boeing 777 fleet features 180-degree horizontal flat bed Business Class sleeper seats with a seat pitch of 78 inches, while Economy Class has a seat pitch of up to 34 inches. All passengers have access to seat-back TV screens and an interactive audio and video entertainment system with more than 1,000 different entertainment options. Featuring a tri-class configuration of First, Business and Economy Class seating over two decks, the Qatar Airways A380 is designed to offer the airline’s signature five-star service with outstanding in-flight entertainment and service on board. There are a total of 517 seats, with eight in First Class, 48 in Business Class and 461 seats in Economy Class. 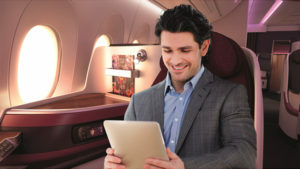 First Class passengers benefit from 90-inch seat pitch, 180 degree flatbeds and 26-inch LCD TV screens while Business Class passengers experience 52-inch seat pitch, with 80-inch, 180 degree flat-beds and 17-inch touchscreen monitors. In Economy Class, the onboard experience is enhanced with 10.6-inch entertainment screens and seats with a seven-inch recline. Privilege Club: Qatar Airways’ Privilege Club loyalty programme has reciprocal agreements with international airlines and tie-ups with hotels, car rental companies, credit cards and other partners worldwide. Oneworld Airlines: airberlin, American Airlines, British Airways, Cathay Pacific, Finnair, Iberia, Japan Airlines, LAN Airlines, Malaysian Airlines, Qantas Airlines, Royal Jordanian, S7 Airlines, SriLankan Airlines, TAM Airlines and another 30 affiliate carriers Airlines: Asiana Airlines, Middle East Airlines, Virgin Atlantic and GOL. No. Of Employees: Qatar Airways Group employs more than 37,000 staff worldwide, of which more than 21,000 are airline employees.